Media Size Choose an option16" x 18"25" x 28"34" x 38"
A perfect tale of twisted events occurs as the Three Stooges are at it again when Larry loses sight of the road while gazing at the beautiful blond walking her fluffy furball. The hard rev from his Harley’s engine overpowers Moe’s loud scream. Then, seemingly out of nowhere, Curly springs off the sidewalk into the street to save the beautiful blond from a dreadful outcome and saving her puppy in the process. 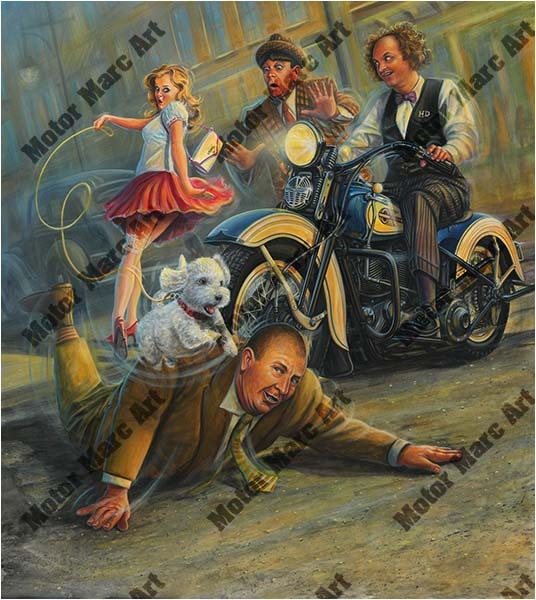 This is Motor Marc’s fourth painting from the Three Stooges Collection of fine art prints. This new release will make a great addition to any collector of Three Stooges memorabilia. In this remarkably detailed work of fine art, Motor Marc captures the past in an action packed turn of events. The unveiling of this artwork at the Three Stooges Convention will make it the talk of the town. 16" x 18", 25" x 28", 34" x 38"